Inspired by an Anthropolgie installation I saw a few months ago, I created a three-dimensional piece of wall art that is easy to install and relatively inexpensive to make (the final budget came in under $50). Aside from wall art, this project also doubles as a photo booth prop, and if you have the time, it would make an awesome photo booth backdrop too. Want to learn how to make your own? Get the full tutorial and see the finished piece after the jump. Before you get started, I wanted to touch on color schemes for a second. I thought a lot about the colors I wanted to use beforehand, and had originally selected five colors to use. The fifth color didn't end up working well with the rest, and so I ended up scratching it after a few botched circles. So what is the lesson here? Don't be afraid to ditch a color if it's not working. I also recommend sticking to a five color maximum. In this case, the wood acted as my fifth color because I left the bare wood showing in many of the circles. Wood circles *The ones I used are from here and the sizes used are as follows: 4 in, 6.5 in, 8 in, and 10 inch. Similar wood circles can be found at craft stores as well. 1. Start by taping off various shapes on one of the wood circles. Be sure to press the tape down securely, especially at the edges, for a crisp line when finished. 2. Paint inside the taped off area, and allow to dry. 3. Remove painter's tape and begin the process again with another color. Or keep it simple, and use only one color. Or use three! Have fun with it. 4. 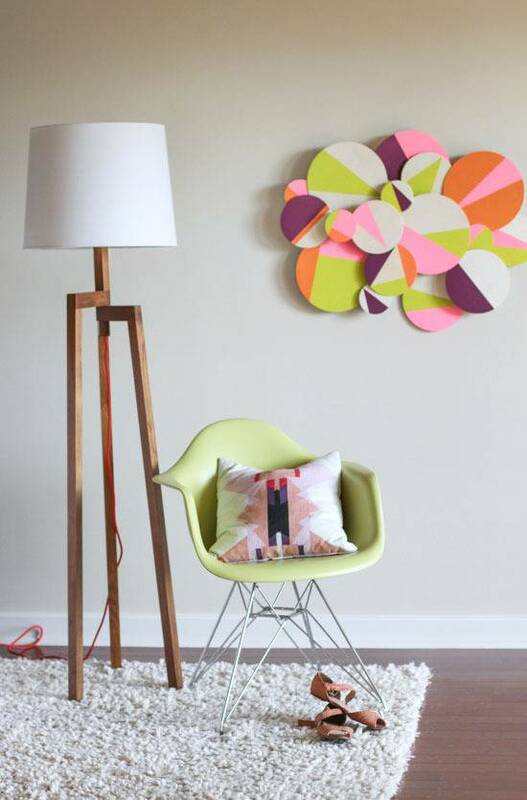 Repeat this process for all of your circles in various sizes, and be sure to mix up the patterns and color combos. 5. Now, it's time to cut some dowels. Using a rotary tool or saw, cut various lengths from the dowels (I stuck to four different sizes for this project - one short, one medium-short, one medium, and one tall). The dowels will determine how far away each circle will rest from the main wood frame that everything is connected to. NOTE: I also attached several circles straight to the wood panel base, without any dowels, which gave me a fifth height. 6. Once the dowels have been cut, set aside and do a dry fit to roughly map out the positioning for where you want the painted circles to line up when everything comes together. Once you start putting everything together, this layout might change, but it's good to have a game plan when you get started. 7. With the design in place, it's time to start gluing the dowels to the back of each circle. 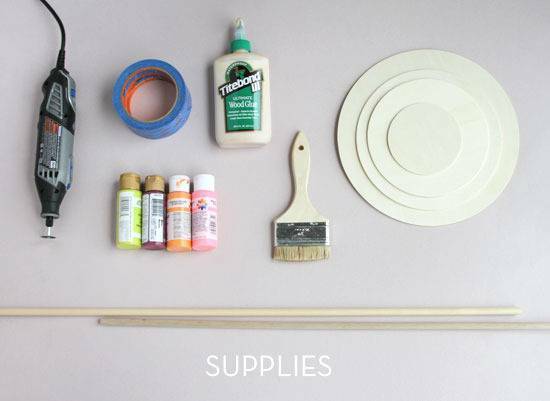 Flip over all of your circles and using wood glue, attach a dowel to the center of each circle and let them dry according to the instructions on the glue bottle. Clamp if necessary for thirty minutes to an hour and do not stress joints for a full 24 hours. You can also use the painter's tape to hold things in place while the glue dries. NOTE: I selected the dowel heights at random, for the most part, making sure that no two circles next to each other would be at the same height. 8. Next attach a saw tooth hanger to the upper center of the hardboard or wood base. Flip over. 9. Now, that you have given the dowels enough time to fully dry and attach securely to the circles, you are ready to attach the dowels to the wood base with more wood glue. Additionally, nails can be hammered through the underside of the wood base and into the dowels for extra security. This helps keep the dowels in place while the glue is drying, in addition to extra security, but is not required. 9. Allow the entire piece to dry for a full 24 hours before hanging. And, as I said before, it also makes a cool photo booth prop. Or anything prop. So what do you think? Will you be making one of these clouds for your home? Hi, how many of each size circle did you use for this installation? I absolutely love this idea and I am definately making one for my house. I was just wondering if you thought that it would still work if I skipped the dowel step and just stuck them straight onto each other? Thanks. Wow! Amazing DIY Wall Art. Love It! Just Showcased this on my blog and linked back to your website. I'm confused about the base? I would have liked to see a picture of the back, so I can understand how it all comes together. This is a beautiful piece though. Wow!! I have been wondering how to create the 3 D effect...You are genius I saw it done with mirrored cycles and wood circles cut straight from branches of tree in a boutique Hotel in Namibia. It looked magnificent!! Please could you send me video of how you did it to carlad@jse.co.za thank you so much. Wow!! I have been wondering how to create the 3 affect you are genius I saw it with mirrored cycles and wood circles cut straight from benches of tree in a boutique Hotel in Namibia. It looks magnificent!! Please could you send me video of how you did it to carlad@jse.co.za thank you so much. Please make a video! !This is amazing! Great idea. Instead of painting the circles, I'll be printing some old photos and gluing them on to make a nice photo wall item. I really love this idea and I want to make one for my living room. My living room is charcoal grey and plum. What color palette would you suggest? Can glitter be used as well? I LOVE LOVE this! My favorite piece of wall art EVER! I must make in blues for my loft. Any way you could post a side view so we could get a sense for the depth / various heights of each of the circles? Thank you!! Love the color choices, and furnishings with the art! Great idea, thanks for sharing. Beautiful piece! It seems like it would be quite heavy...maybe the wood is thin & lightweight? BTW, styrofoam disintegrates when sprayed with spray paint. There must be a place that sells cardboard or foamcore circles. I think it would be hard to cut them accurately yourself--although wonky, naive circles could have their own appeal. Thanks for the tutorial. In my experience, styrofoam doesn't seem to accept paint evenly. BUT if you have to use styrofoam, spray paint would probably work better than standard acrylic paint and a paint brush. Overall, I would not recommend styrofoam for this particular project though. I love this but can't seem to get my hands on the wood circles. I saw you can order them online but I'm not sure if I want to. Do you think I could do this with styrofoam circles? I have no idea if you could paint them though or would it just absorb the color/paint? Great idea CCi...then you could pin things to it too, like a bulletin board. I like that idea! Although, if you do go with cork, you may need a few coats of paint for each circle because it's such an absorbent material. If you don't have access to wood circles, I imagine this could be replicated using Ikea cork trivets and coasters. It would be lighter, too, although you'd only get two sizes of circles.